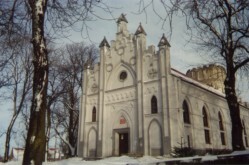 Przedecz commune is located on Wysoczyzna Kujawska, and the city at South-East bank of Przedeckie lake. First mentions about Przedecz is come from 1136. Przedecz got city' laws in 1365 from king Kazimierz the Great, which it has lost in 1867. It has obtained city' laws in 1919, again, keeping it to present days. In historical description there are mentions, that at times Boles�aw Chrobry there was built castle of kujawscy dukes. That castle was burnt, and in 1360 king Kazimierz the Great built brick castle with tower (it remains to present days). 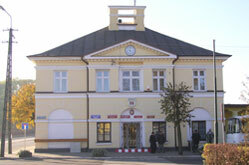 In 1826 the Town Hall was built (nowadays it is a building of UMiG Przedecz). To other interesting objects belong: neo-gothic church from beginning 20th century, brick belfry built in 1834, Town Hall and Urban shambles from 1826 and as well as Roman-Catholic, Evangelic and Jewish cemetery. In Przedecz W�adys�aw Umi�ski (1865-1954) was born, The author of popular books for youth.